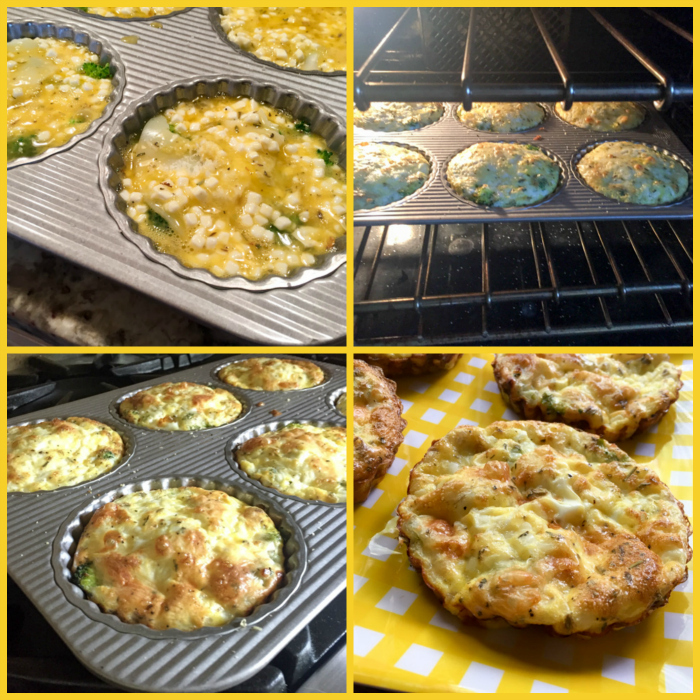 Another great recipe from Kalyn, who knows her way around a low-carb way of life. If you feel like taking a step back from the excesses of Thanksgiving, this is a very nice option for breakfast, brunch, or a light lunch. I used my beloved tart pan, but you can make it in muffin tins, or even go for a single, larger pie type pan, increasing baking time a little bit. Heat oven to 375F/190C. Spray tart pan or muffin cups with non-stick spray. Place the broccoli pieces into a bowl, cover with cling wrap, and microwave on high for about 1-2 minutes, or until broccoli just starts to cook. Divide broccoli among the tart wells. Put a generous pinch of cheddar cheese on top of the broccoli, then add coarsely grated Parmesan on top of the cheddar. Put the cottage cheese into a fine-mesh colander, rinse with cold water, and let drain. Break eggs into a glass measuring cup with a pour spout, and beat with a fork until egg yolks and whites are combined. Add drained cottage cheese, thyme, oregano, salt and pepper. Stir to combine. 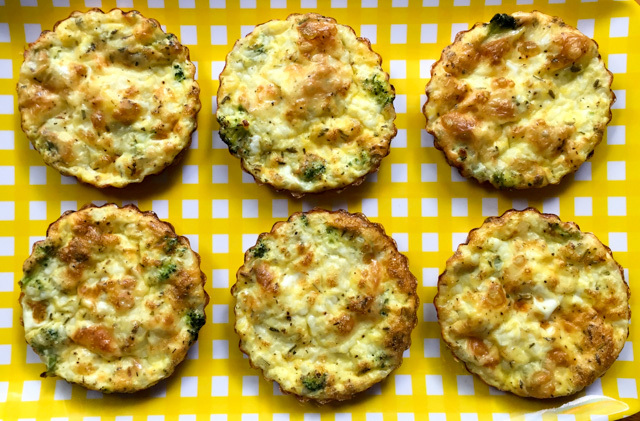 Pour egg mixture over broccoli and cheese, dividing the eggs evenly among the tart wells. Stir gently with the fork so ingredients are evenly distributed. Bake for about 30 minutes, or until eggs are firm and frittatas are starting to get slightly browned on top. Frittatas can be kept in the fridge for several days and microwaved to reheat. Don’t microwave for more than about a minute or the eggs will get rubbery. Comments: I absolutely love this type of recipe that I can make in the weekend and then enjoy for lunch the following week. I prefer to warm them up in my little electric oven, because it gives much better texture than the microwave, but if you follow Kalyn’s advice and keep the microwave time short, it will still prevent the dreadful rubbery-egg-syndrome. Cottage cheese was – for me – an acquired taste. When I first moved to the US, I did not like it at all. But for one reason or another I kept trying it and started to enjoy its unique texture and mild taste. Nowadays I can even eat it straight from a spoon, as long as it is crowned with a little shower of salt and coarsely ground black pepper. A little za’atar would not hurt either. In this preparation, it offers a perfect creamy texture to the frittata. I love to pair these babies with some juicy tomatoes, but the time for that is unfortunately over…. Must wait for Spring, which obviously cannot come quickly enough for me (sigh).